Here at Globe Dental Practice, we pride ourselves on offering service that cater to the entire family – and that means the little ones, too! We offer full NHS services for all children up to the age of 18, helping them to take care of their teeth as they grow and develop, as well as ensuring they have a beautiful smile for later in life. When your little one’s teeth start to erupt, gently clean their gums with a damp wash cloth or a clean gauze pad. 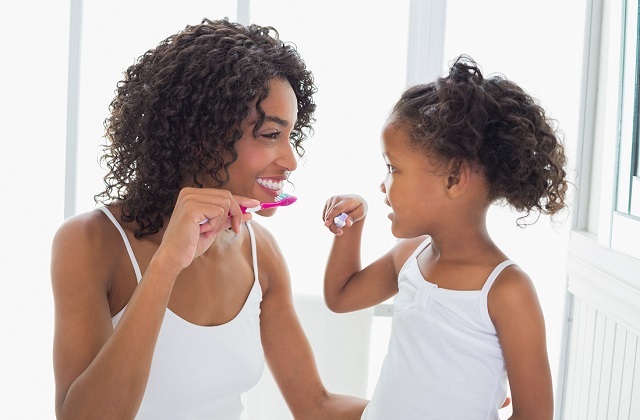 The best dental hygiene habits start early! Use short strokes back and forth over the front, back and top of the teeth. Don’t scrub too hard, or focus too much on the gums – this can irritate them. Don’t forget to brush behind the teeth! Many little ones forget or overlook these areas, which can be a breeding ground for tartar build-up. Invest in a good children’s toothbrush with a slightly longer tip, to ensure little ones can reach their new back teeth. All children love a sweet treat now and then – but did you know that it can take 30 minutes for a child’s saliva to neutralise the acidity that sugar causes in the mouth? This acidity can breed bacteria, which then increases the chance of cavities and tooth decay. A piece of chocolate or a biscuit every now and then is fine – but ensure that your little one is brushing their teeth regularly, and not indulging in too much sugar. Children should see the dentist every six months or so, starting from around the time of their first birthday. It helps if you have a regular dentist that you can build a relationship with – your dentist will become more familiar with your child’s teeth over time, and your little one will be able to build a rapport with their own dentists, helping them to feel more relaxed about appointments.